So Zari Hassan's sleepless nights are far from over. Just when she was struggling with white washing the affair between Diamond Platnumz and Hamisa Mobetto, it turns out there is another affair she has to deal with and this is none other than the Big Brother Africa 2013 'The Chase' winner, Dillish Matthews. 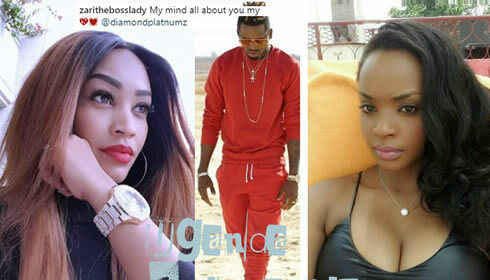 Dillish has a clip when she is dancing to background music of Diamond PLatnumz just like Hamisa Mobetto did, she wiggled her behind to Diamond Platnumz Eneka song on the 40 day celebration of her child whose father is the singer 'based on logistics' The party was held over the weekend. In the last few days, Hamisa has been releasing all possible&nbsp;information&nbsp;pointing to Diamond Platnumz as the baby daddy. She has shared pics in the same bed with the singer, pics of Diamond Platnumz' mom visiting her in the same hospital where&nbsp;Zari gave birth from among others,&nbsp;have all been leaked. In all this, the main act in the movie is Diamond Platnumz who seems to be moving on to another girl, Dilish Matthews who is equally a no joke when it comes to the man snatching games, Kenyan singer Avril lost her man to this one...When all this got to Zari, she just broke down. In her latest post, Zari has left this whole thing to God. "Half time is not full time and HIS calendar for your life is not man's calendar. BE ENCOURAGED! DON'T GIVE UP. With God all things are still possible! Everyday is a fresh start with potentials. .. keep the faith.... keep on believing in God. God is the referee of all referees until he says it is over. Have a blessed week ahead, " Zari noted regarding the developments. Platnumz is not bothered as he shared this pic taking a swim captioned as; "Mtu flani hivi nsiejulikana" translated as; "This person is not known." On the other hand, Dilish Matthews from Namibia is so excited about her new found love and project she enjoyed while in Zanzibar, Tanzania, she shared the pics and it turned out, it was the same location with Platnumz..
Dilish Matthews is being warned that she could also be played the way Zari and Hamisa Mobetto have been played, so she should not be very excited. Meanwhile, Zari was on Snapchat busy responding to all those who got concerned that she does not fight for the tiny leg, she fights for investments instead, see screen shots below. Like us on FACEBOOK: Facebook.com/BigBroAfricaFans & Follow us on Twitter @BigBro_Africa for more Big Brother Africa News and Updates.